I’ve been going to the Maker Faire on and off over the years since it first started in 2006. The original one in San Mateo is spectacular, but it has gotten so big and crowded in the past few years that it’s just not as enjoyable to me anymore as it was before it got super-crowded. But the East Bay Mini Maker Faire, which just happened last weekend? Just the right size. Community-sized, and if you live in the area, there’s a good chance you will run into more than one maker or attendee that you know. At last weekend’s event, I got to wear a “Maker” badge for the first time. I was helping the Alameda County Beekeepers Association, showing off a demonstration hive to visitors, answering questions, giving advice, and occasionally selling a jar of honey that came from my bees or from one of the other booth volunteer’s beehives. 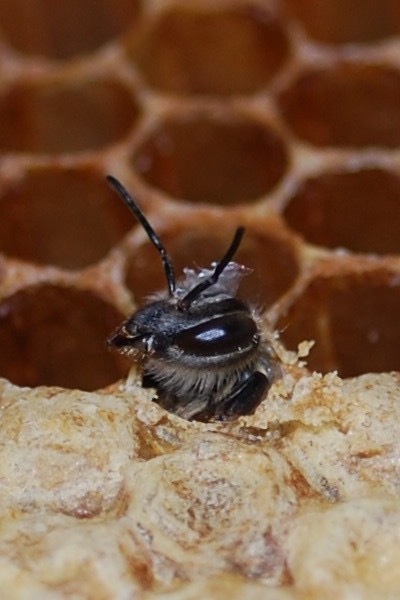 Is being a beekeeper really being a “maker” in the strictest sense of the word? Sometimes I would ask children at the booth just who were the makers at our booth, and they would invariably point to the bees. So, tongue in cheek, I covered up the “M” on my badge and hand-drew the letter “T” so it read TAKER. Even if I’m merely taking care of the bees and collecting their excess honey from time to time, it’s an activity that I enjoy becuase it’s doing something in the real world, not the virtual world of websites and programming. It’s a nice occasional break from my “day job” to check on the hives, collect honey, rescue a springtime swarm, and so forth. Every kid — and just about every adult — who saw what I pointed out in the demonstration hive was excited and fascinated. The frames that could be seen thorugh the plexiglass were covered with brood (egg) cells, and throughout the day, it was pretty easy to notice a few “new bees” starting to hatch out of their cells. Maybe you could just barely see the antennae wingling out from a chewed-open hole in the cell, or maybe the bee had gotten its entire head out and was slowly emerging. If you live near a Maker Faire — one of the main ones or a “mini” maker faire, I can’t recommend strongly enough that you check one out. They are happening all over the world. Recently, bicycling and pedestrian advocates in the town where I live have been managing to make a bit of headway in an otherwise car-centric culture that’s typical of almost all U.S. cities. After being ignored, and then laughed at, we’re now at the stage — if you recall the Gandhi quote — where the opponents to safe streets are fighting back. They want to make sure that our Central avenue, currently an uncrowded four-lane road, stays that way (even though the speed limit is 25 MPH). Ironically, I think it’s the same people that are against providing for other forms of transportation who also complain about too much traffic (by other drivers, of course). 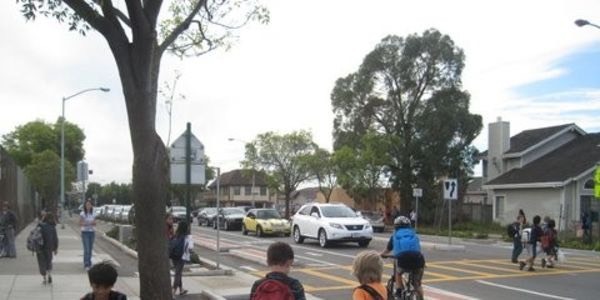 Our local advocacy group BikeWalkAlameda started a petition — both an online petition and the old-fashioned type — to show that there is support for safer streets for people of all ages. If you live in, or near, the town of Alameda (or even if not! ), I invite you to add your name. 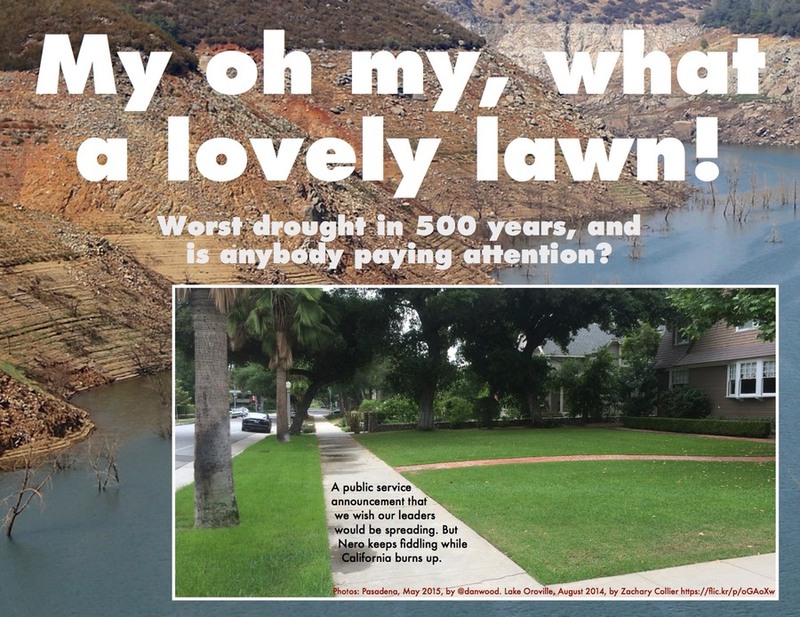 California’s water waste is awful — but my idea to stop it may be counterproductive. Last week I was down in Southern California, and I was astonished to see lush, green lawns all around me, at least in the town of Pasadena where I spent most of my time. Considering that we are in the middle of a record-shattering drought in California, I couldn’t believe my eyes. 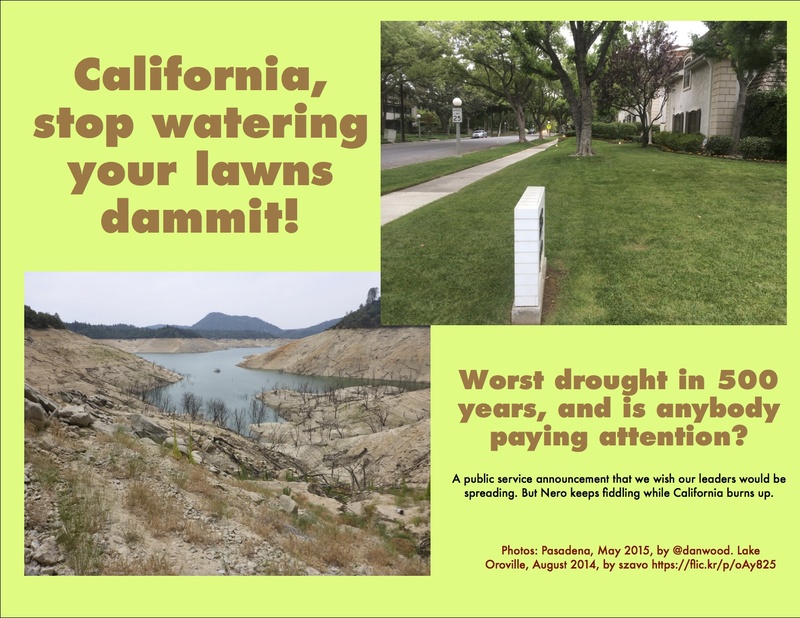 So with a bit of image-searching in Flickr, my own iPhone pictures, and some inspired snark, I put together two hypothetical “public service announcements” that I wished would exist, to get people to realize how destructive and wasteful it is to be watering your lawns this year. But a few days ago, I happened to read Think Like a Freak, the third in the Freakonomics book series by Levitt & Dubner. And I came upon a story that explained how public service messages just like this one, which draw attention to the behavior you want people to avoid, actually ends up increasing the bad behavior. They discuss a study by Robert Cialdini where they found that the signs in Arizona’s Petrified Forest National Park asking people not to steal pieces of petrified wood actually increased their theft. So I guess that means that pointing out to Californians how they are wasting water is just making it worse. So we need to come up with something that actually works. But still, it’s fun to dish out the snark, isn’t it? I guess for the basic Mac user, the alerts that InstallerMac puts up look innocuous and even helpful. Nobody remembers how it got installed. It might have been masquerading as an update to Adobe Flash in at least one instance. Looking at the steps that are required to really remove everything that this malware leaves on your system, it’s clear that this stuff is insidious. Back in September of 2014, I submitted a bug report (18193924) to Apple begging them to do something about this. No response yet. Doesn’t it seem like Apple should take this kind of thing seriously? Isn’t that what XProtect is supposed to help us avoid? If you have a developer account and can get to bugreport.apple.com, why not submit your own bug report? We’ve all been infected with earworms from time to time. Usually they go away, for me, after a couple of days. Alas, Kelly Clarkson’s 2004 breakout hit “Since U Been Gone” has been invading my consciousness for weeks, perhaps even months. To quote the Electric Light Orchestra song, I can’t get it out of my head. Even the peaceful vistas of Yosemite National Park last week didn’t cure it. Apparently, scientists are saying that you can push an earworm out of your head by solving a mental puzzle like an anagram. That’s all well and good, but I usually don’t have a collection of anagrams with me to work on while I’m walking the dog or washing the dishes or driving/riding somewhere. At least while I’m working, I can usually listen to my own choice of music to keep the earworm away. But heaven help me if I’m reading a book and it’s quiet around me. Here comes Kelly, again. Yeah, it works. But after 25 years, I’m getting a little bit tired of that song. Anybody else have any suggested treatments for a case of earwormitis? Hopefully something milder than electro-shock therapy but even that’s tempting if I could erase that song from my brain! At last week’s Yosemite conference, Michael Lopp closed out the sessions with an inspiring talk about writing. But often ranting (usually on social media, not so much in long-form writing) ends up just complaining and spreading negativity. Like that crying baby in the airplane a few seats back, or having to wait for the dishwasher repair dude too long, or the bad service you got at the restaurant. To me, all that seems to do is to amplify the negativity for yourself, and spread negativity to others. To me it seems like the people who complain a lot are the ones who seem to always have these things happen to them. They guy who rants about babies crying in the movie theatre? It seems to happen to him a lot. It’s like the complaining attracts more negativity. At Yosemite, one of the presentations — I think it was the one by Jamiee Newberry, who talked about her “31 days 31 people” project of expressing gratitude — reminded us to focus on what’s good, and be grateful as a way to be happier. So I’m personally going to modify Lopp’s advice to rant, and come up with a type of rant that’s not negative! How about ranting with gratitude? I’m considering some grateful rants to post in the days or weeks ahead. Stay tuned. 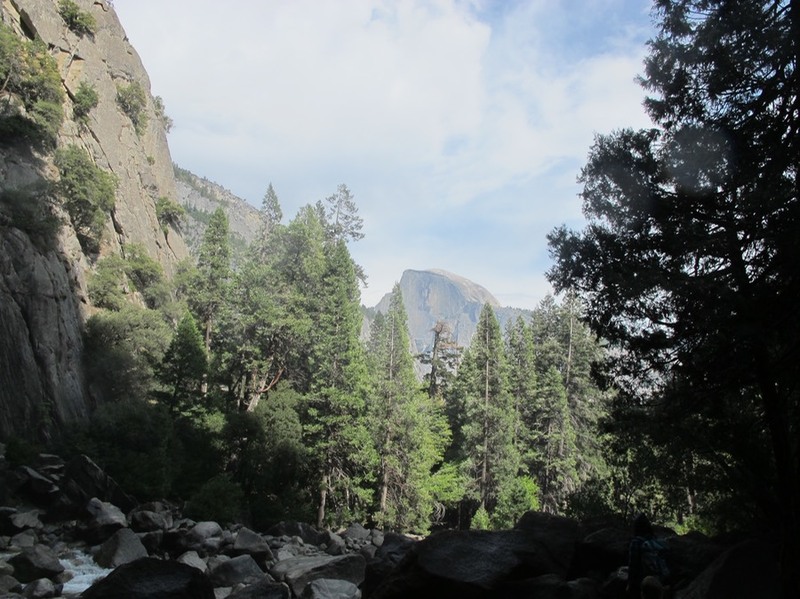 Mac developers and Mac enthusiasts probably equate “Yosemite” with the 10.10 version of the operating system; most others in the world equate the word with California’s gorgeous, dramatic park. 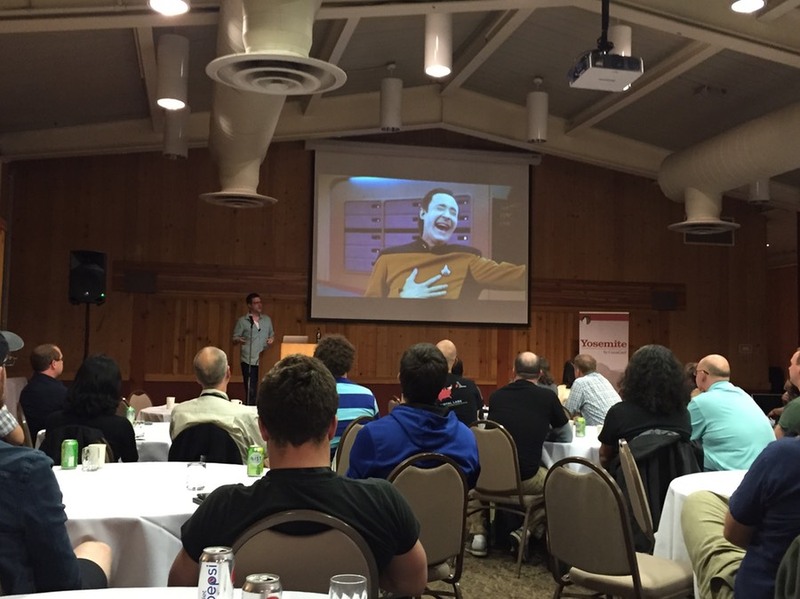 This last week, I was privileged to firmly place myself in both camps, by attending the conference Yosemite, by CocoaConf. Their tagline of “The Apple Conference with a View” sure wasn’t kidding. The talks at the conference were entertaining and profound. And while the presentations were conceived and delivered independently, the theme connections between talks were so strong that it felt like they were part of a planned network. Andy Ihnatko (I’m imagining that the “H” in his last name might indicate aspiration — a puff of air, when pronounced, extrapolating from what we learned from Laura Savino) told us what he really thinks about the ten-thousand-dollar Apple Watch; his perspective on the importance of not being constantly bombarded by information and distraction was echoed in many other talks as well. That’s just a small sampling of the wonderful presentations. 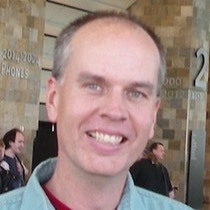 Oh, and Michael Lopp inspired us all to start — or restart — writing. The result is manifested here; let’s see if I can keep it up. Oh, thanks for the awesome pen. All in all, the Yosemite conference was inspiring and amazing, both inside the building and outside of it. My thanks to the Klein family for organizing the event, the many speakers who were either old friends or, hopefully, will become new friends, and the many attendees I got to know (especially by following the C4 habit of sitting at a table with people you don’t yet know). I raise my glass in a toast! © Fernando Morgan, used by permission. 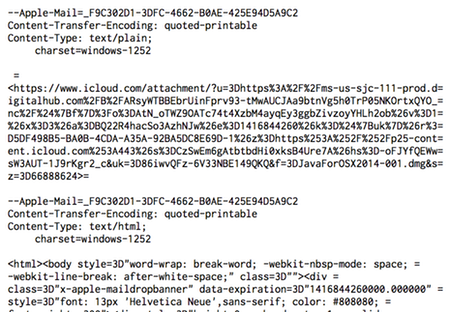 Yosemite’s “Mail Drop,” with plain text emails, considered harmful. Yosemite has a cool new feature “Mail Drop” which is really handy for sending large files without having to resort to file-sending websites or DropBox (or its non-Condoleezza-Rice competitors). If Apple Mail detects a giant attachment, it will offer to send it via Mail Drop, which means that the file is uploaded separately to a temporary iCloud URL. It will stick around for 30 days. The problem is that if you use this technique, it’s possible that any actual textual message might not be seen by the receiver of the email message. If you send your email message as plain text — you might not even realize that you are sending a plain text message or a rich text message —or if the receiver’s email client shows them plain text instead of rich text — then ONLY the Mail Drop URL will be seen by the receiver. Not your important message. Even if you commit to never sending a plain-text message with Mail Drop attachments, and you deselect Mail’s preference “Use the same mesage format at the original message”, you are not out of the woods yet. If the receiver is using a mail client that prefers the plain-text portion of rich-text messages, then the problem happens there too. 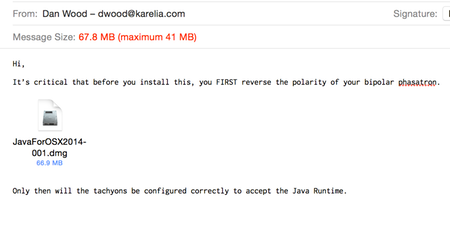 That’s because the plain-text portion of the rich-text message lacks any text besides the Mail Drop link. Here’s an excerpt of a rich text message’s raw source — note the text/plain segment containing only the URL. This is a real concern! For instance, we use FogBugz for tracking support cases, and while I want to encourage people to use Mail Drop for sending us large files when needed, we need to go through a lot of hoops just to determine if their message had any useful textual content in it. Because all we see in a message that included a Mail Drop attachment is a big honking URL. This isn’t just a rant; I’ve reported this to Apple (radar 18756471). Hopefully they take it seriously! If you, dear reader, know about Apple radars, feel free to file a duplicate if you think it’s sufficiently annoying. If you have a family member or friend for whom you end up taking care of their Macs, you may want to share their screen and take over their computer so you don’t have to spend hours giving them instructions on what to do and asking them to read what it says. I tried using screen sharing with my mom, but her router wasn’t going to let that work. Messages.app didn’t let her share her screen for some reason. But then she came across TeamViewer. And it works really nicely. 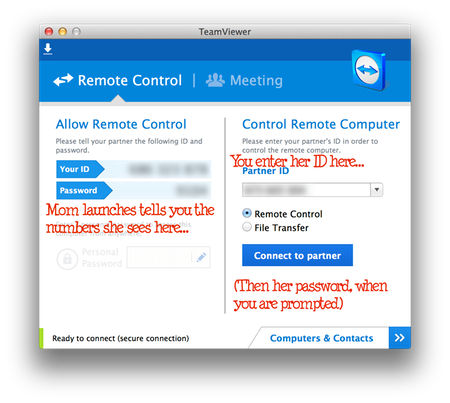 They way it works is that you both launch the app, and Mom tells you her ID and password; you enter her ID (and then her password) and you are on your way! My father passed away yesterday after a long, losing battle with Parkinson’s disease. And yet, I already was saying goodbye to him in some ways for over a year. That’s why his ending date really wasn’t 2014. Because his Parkinson’s took a bit of him away at a time, to where there wasn’t much left when his body finally finished its journey. And though many reading this memorial never knew him — or don’t know me, for that matter — this is my memorial to Kenneth Herbert Wood. These years have taken an especially hard toll on my mother, who could no longer care for him at home. But even with my father at a care facility, she still had many duties to perform, while spending an unbelievable amount of money. When Dilbert’s Scott Adams published his essay “I Hope My Father Dies Soon,” it certainly struck a nerve. When I would visit him, at first he was mostly “there,” mentally. He even achieved some fame within the facility and made the local TV news with a feature on him, due to his talent at drawing amazing portraits of his fellow residents. (Somehow his shaking hands would calm down when he was drawing.) But then he deteriorated more, mentally and physically. When I would see him, there would be some of the man I remember, but not much. And less each time. So over those months, I found myself saying goodbye to him, at least in my own heart. He was shrinking, reverting, losing memories and physical abilities. Then, late last week, he took a major turn for the worse, and never woke up. And I’m very sad that he’s gone, but it’s also a blessed relief that it is over. I try not to think of the recent months where his body, even his face barely resembled its former self. Instead I try to think of the hero that my father was, and replenish my mind with memories of before the Parkinson’s. My dad was artistically creative his entire life. As long as I can remember he had been drawing, mostly cartoon-style. 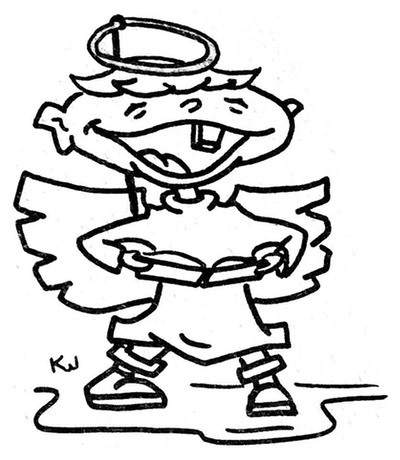 He would apply that talent to drawings he’d give as gifts to the kids, or make into personal greeting cards for friends, or wherever something graphical was needed, or in support of his work. He’d create advertisements for the local country newspaper and community events. When I was about 10, he started creating some children’s books. “The Pickle Machine”, “Exactly Like Me”, and “Jeremy Dingle” never were published — he tried but didn’t get any bites from publishers — but they delighted us and have delighted my kids as well. Another example of how the Parkinson’s took hold was related to one of his children’s books. 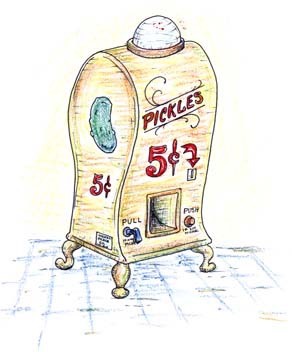 I had made a color copy of “The Pickle Machine” for my nephew so that he could enjoy it too. 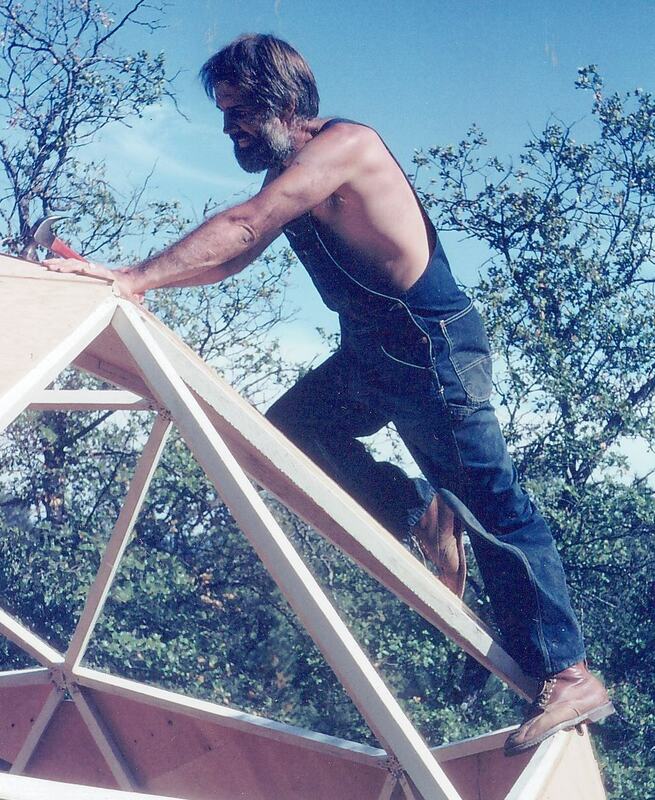 But for reasons unknown, my dad decided to rework the story, and had grand plans for changing the story. Though he wasn’t able to draw much, he would obsessively redo parts of the story, having whoever was near him help him cut drawings out, re-write the text, and rearrange sections. And yet nothing of what he was doing made any sense. It got to a point of mania. Finally, in a moment of clarity, he consented to putting the entire project away on a high closet shelf. Fortunately, the original, unaltered version still rests in my house. I have no desire to keep, or even see again, the Parkinson’s remix. 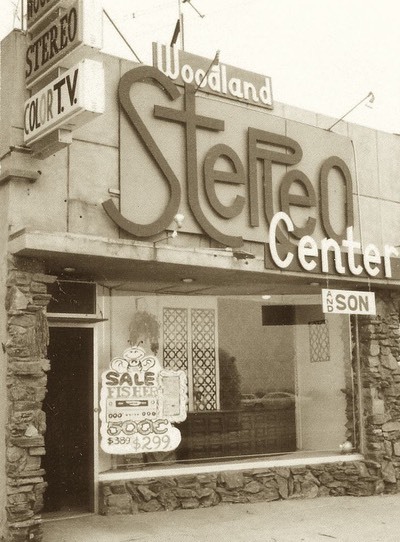 When I was born, my parents owned a stereo shop back in the sixties, Woodland Stereo Center in Woodland Hills, California. (Yes, one of the brands sold there was Kenwood!) The picture below was taken shortly after I was born, if you notice the addendum to the main sign! 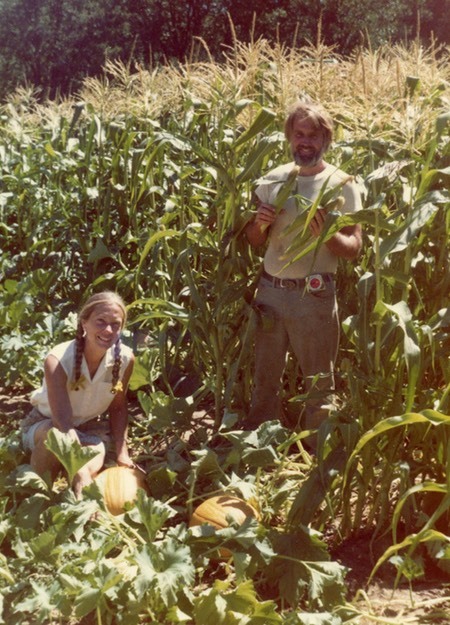 But when I was about seven, my parents – from the generation too old to be considered hippies — got bit by the “back to the land” movement in the early seventies and decided to move from the suburbs of Los Angeles to the country in Northern California. I remember being driven around in our family’s blue VW van while my parents looked for a place to live and start a new life. Finally we found an 18-acre property in the Sierra Nevada foothills, completely undeveloped, and decided to stay. And on that property, with the help of my mom and some neighbors — and as much as we could, the kids — he built a house. From scratch. 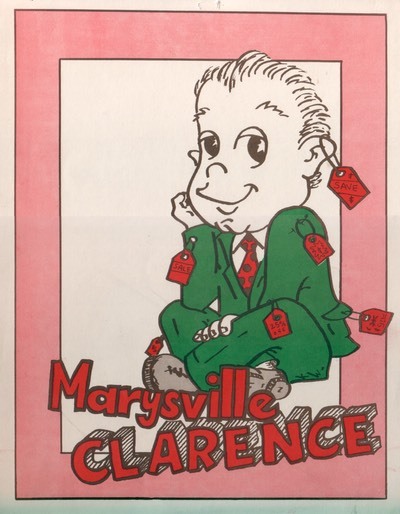 And while it was never quite finished – we moved in way before there where amenities such as wallboard or plumbing or electrical outlets — I lived in the house my dad built until I moved away for college. Ken never had a single career track — the farming never really made a decent living for us — but overall I’d say that his biggest strength was sales. Selling hi-fi’s and stereos, then after moving on from the farming, he’d done well with selling advertising, solar water heaters, encyclopedias (along with my mom in that venture), and so on. A skill that I never could quite grasp, yet he excelled at it and thrived at it. His biggest love — besides his family — was music, though. His classical record collection — on LP and reel-to-reel tape; later on CD — was enormous. 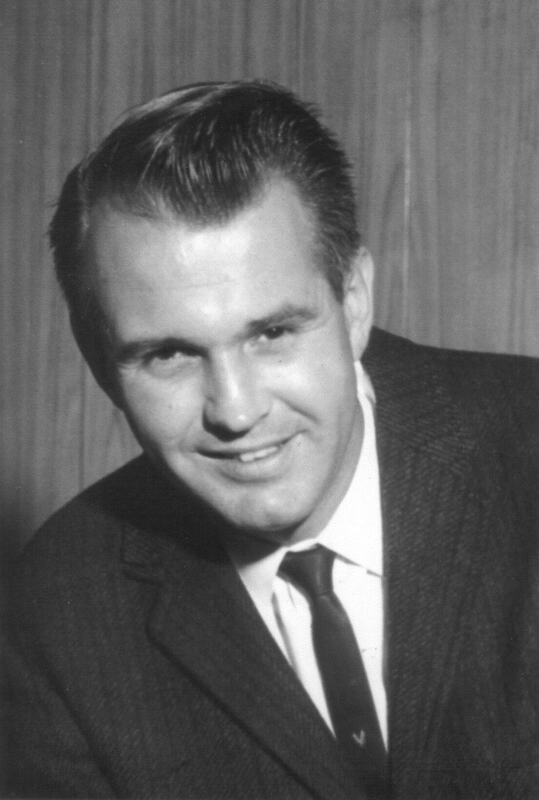 He enjoyed very little in the popular music genre, though he did have a weak spot for the lead singer of the Stone Ponies, Linda Ronstadt (who, as it turns out, is now afflicted with Parkinson’s). While he tolerated the music that his kids listened to growing up, it was Beethoven and Mozart and Schubert and Chopin on the stereo in my house growing up. And opera, which I never really could appreciate the way I eventually started appreciating orchestral music. In his last year or so, he had a small stereo and a modest collection of his favorite music with him at the “old folks’ home.” I’m glad he had his music to keep him company, though I don’t think he was really able to make use of the equipment for the last few months. 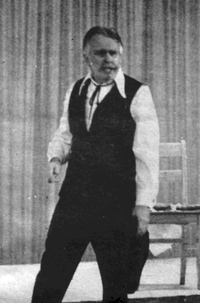 Parkinson’s took away his singing and speaking voice, gradually, though sometimes there were little reprieves. I wasn’t there, but a couple of years ago, there was a memorial service for a friend, at a time when the disease had taken away most of his voice, where he found himself singing, full-strength, a song in tribute at the memorial. For those who knew him there, it seemed like a small miracle. I wish I had been there for that. I also remember him acting — a talent that completely skipped my generation. But he loved performing in community theatre, and also created a one-man show that he would perform week after week at a local campground resort, where he would play the famed stagecoach robber Black Bart. Last year, my mom found an old reel-to-reel tape that was labeled somewhat cryptically along the lines of “Baby Announcement.” Intrigued, but with no machine to play it on, I took it home. Some research found a service that would convert a reel-to-reel tape into MP3 audio. Taking a gamble, I ordered a digitized recording. What came back (over a file download) was a treasure. 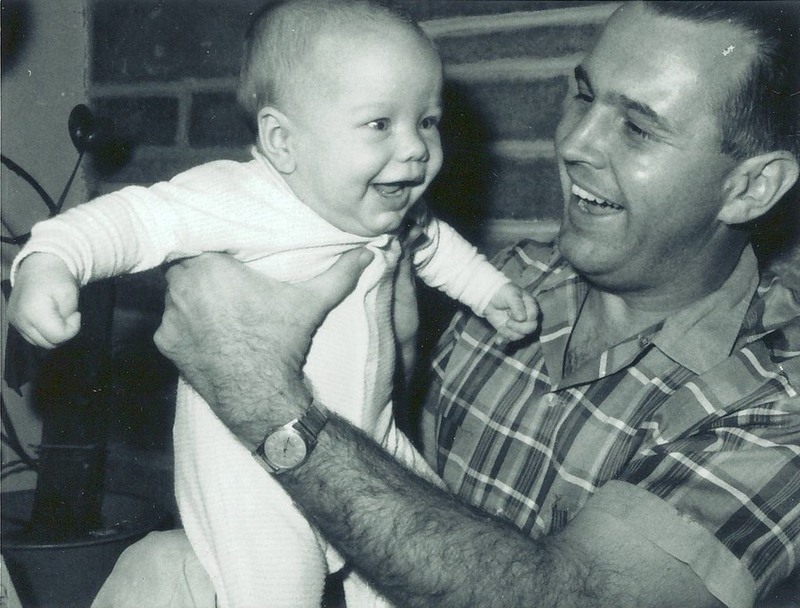 When I was born — I’m the oldest — my dad had come home from the hospital, fired up his tape recorder, and called the relatives to announce my arrival. Hearing his speaking voice at its full strength — he was younger than I am now, actually — was amazing. I could also make out the voices of my grandmothers through the phone. Later in the tape, interspersed with odd recordings of music and television, so I’m glad I kept at it — I found other recordings from my own early childhood that he made while he was watching me. Amazing. What a great vault of memories from my life, from a time when I was too young to remember myself. 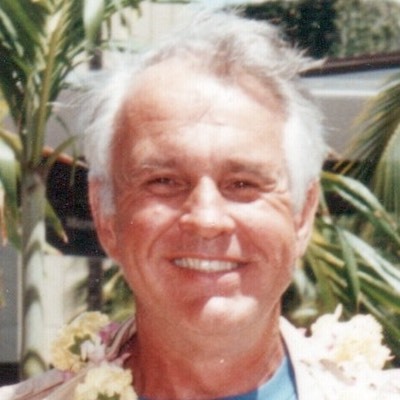 My dad was an amazing man and a loving father. And I know we had a good relationship throughout the entire intersection of our lifetimes. And I will miss him terribly. And after all that Parkinson’s disease took from him, I’m glad that his journey is finally over.